"Condition, condition, condition" being the mantra of many dealers and collectors of Japanese prints, it is understandable why you might be tempted to greet a sheet like Fig. 1 with a grumble and a scowl. After all, the kabuki actor ukiyo-e has smoke-like stains intruding into the sky in the upper right, and the lower left corner looks for all the world as if a baby mouse has helped itself to a bite. These two unfortunate "condition issues," serious affronts to the demanding gods Mint and Pristine, could easily result in the 6/1823 print by the Osaka artist Kunihiro (active c. 1816-41) being abandoned to the ninth circle of eBay. On the other hand, its owner also has a great deal to be thankful for. The sheet is refreshingly untrimmed ("full paper" in the parlance of enthusiasts), the faces, the most important area of an actor print, are clean, and the natural vegetable and mineral pigments — most notably the famously fugitive purple — are still fresh despite their 180+ years of age. And there's better news yet. Experience suggests that one of the two problem areas is readily remediable. For a modest sum, a competent paper restorer can replace the mouse nibble with pulp almost indistinguishable from the original. As for the pollution in the sky, that too can be at least improved, thanks to a restorer's ability to wet stains with water or alcohol and then draw out impurities using a suction table. In contrast, Fig. 2 represents an instance when restoration is not a commonsense option. Swaths of washi are missing from the top and left side of the piece, and the 80% of the design that remains is thoroughly soiled and rubbed. This means the print can never again look fresh. Worse, not only the purple but also the blues and reds have been destroyed by over-exposure to light, a loss that is fundamental and beyond repair. All in all, Fig. 2 represents the type of piece that is unworthy of the time and energy of a skilled professional. Other factors that should be weighed when deciding whether to restore a print are rarity and cultural or scholarly importance. As for the first, the Kunihiro design seems to have survived in only a few impressions, and the one that has been published is badly chewed and grimy — in a far more ghastly state than even Fig 2. Chalk one point in favor of carrying Fig. 1 to a restorer. 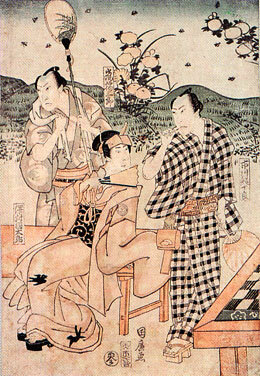 Two more points are scored because, distinct from being "just another actor print," the piece under consideration depicts a trio of Kabuki celebrities far removed from the stage and out of costume. Attired for a languorous summer evening of firefly viewing — note the uchiwa fan attached to the bamboo pole, presumably to excite the insects and make them glow — the superstars for once have left the make-up and cross-eyed mie behind. Such casual out-in-nature "snapshots" are sui generis in Osaka, and invariably full of significance for kabuki experts and cultural historians alike. On the minus side, the archaic Chinese character for "3" can be seen in a circle at the bottom of the image. This strongly suggests that the composition is short at least a pair of companion sheets. 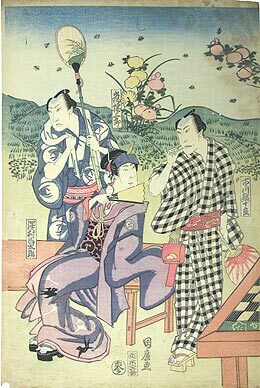 In fact, in this instance Kunihiro spread his design, very unusually, over the full width of a pentaptych, the conceit being that no fewer than a dozen important actors had come together for the refreshing cool of the evening outing. Sigh. This extreme incompleteness muddies the picture far more than the smudges in the sky. No matter how intriguing the firefly design is, do I shake the piggy bank and tax my overstretched restorer for the sake of a mere fraction of a complete design? This article originally appeared in Daruma, no. 45, Winter 2005. Copyrighted © text and pictures reprinted with permission.